I do not have much news for you. This time I will go straight to the point. Numbers are something that most of you are expecting in my reports. In my next report I will try to include more details but this time I will be very "on topic". That is in total ...[PLEASE LOG IN TO READ]... That is almost three hundreds bucks more than previously. Moreover that is very good payout to the work time that I have lastly done and is great level of earnings in the country I live in. It is the place to make conclusions... So what can I say? As said previously I have been working on increasing my AdSense income. You may see that it is higher than usual. But I am not satisfied with amount of work I put into it. Currently I am developing two new applications (Android and iPhone) and keeping my income with methods described in my eBook. So the conclusion is that I should get rid of most of my time-consuming tasks that bring lowest income. From now on I will keep doing mostly my mobile development projects. Moreover I REALLY want to be more active on my blog, Facebook and twitter channels. As the community is something that motivates me in my daily routine. So hope to see you around soon! How much time did you spent on everything together? On average about 4 hours per day Monday-Friday. Wow, that is a lot with 4 hours working on your own stuff, thats great! What do you during the rest of your day? Enjoy life? Hi Kreci, tnx for great articles, i am wishing you all the best in the future and to triple earnings! 1. Are you programming same type of app for both platform (iPhone and android) or totally different apps? 2. When you are thinking about new application idea, what is the maximum time you are planning to dedicate to single app development? 1. Some apps yes – some no. 2. Depends how good the idea is. If it is worth to spend more time on it I will work on it. If not – then I gave up the idea. I am experiencing a little lower fill rate for my app last week. (dropping below 95%). Now is somewhere around 89%. That was my only app and fill rate was always near 97% every day (daily revenue ~15$ , ~25000 requests daily). I wonder is it because i recently released 2 more apps using same admob account? Maybe admob is reducing fill rate for your best app if they see you are adding more apps? I suspect that Admob is splitting or limiting fill rate between single account apps :(. Do you know something about this? Do you have always a good fill rate? In my opinion some months have better and some lower fill rate because of number of advertisers in the current month. On my account same apps have $100 – $200 difference each months. Some ups and downs. And hard to guess exactly why. Big congratulations. Do you focus on consumer apps rather than business apps? If so, why? Thanks again for the update. Your ad revenue is fantastic, and very inspiring for me as an Android developer still starting out. Looking forward to seeing your new Android app when it’s released! Have you considered using incentivized offerwalls like Tapjoy? App B has almost twice the number of downloads in a shorter period of time but this hasn’t been reflected in the revenue. My placement within the market for search terms is sporadic, seemingly minor changes or updates can take my apps to the top of search results and with the next update they can be gone completely, even when searching the exact name! I hope to have 4 applications on the market by the end of July. My main reason for this is so I can ‘cycle’ through and update each app, hopefully to the point where I no longer have to rely on the ‘just in’ list to generate large amounts of traffic. That is interesting comment. I think that income can be different because of different place of adds on screen. Maybe in App A add is in place on screen that users click more recent? Well, obviously your second app is not used as often. See the number of impressions. It’s only a third for app B. Also the CTR is lower – so your income is lower as well. Now that Google has decided to completely kill the Just-In list with the updated mobile Android Market app, thus making it impossible to get new users by adding or updating apps, do you still see any possibilities to make money with Android? It’s done. And I’ve read it. And although I’ve already been thinking about everything that’s in your book, you did motivate me to give things another look and improve certain things about my current apps here and there. Actually, I’ve applied one of your techniques a week ago to one of my apps and this week I noticed a slight rise in popularity, so I guess I should spend more time to focus on that instead of what I did before (can’t describe that here because people will need to buy you book to figure that out ;). hey Kris, how do u take care that your Admob account is not blocked. I am publishing ads using admob. Many people told me that Google blocks Admob soon as u start making huge money from it. Please give us some tips so that our account is not blocked. for example some activities that happen accidently, or during app testing etc. For me it is working just fine as I am not doing anything unusual. I am just creating and publishing apps with their code and never ever try to make people click ads in your applications by accident. Just follow the rules and they should not block your account. Nice work KreCi. I had no idea that the free app model could be this profitable. thanks a lot for the reply Kreci. 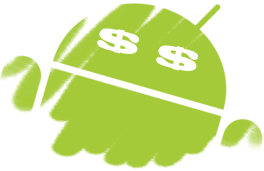 I will definitely refer to your blog when I start post about making money from Android Apps. “never ever try to make people click ads in your applications by accident”. I have apps with buttons above the add. To have space above for the rest of my app. I can imagine people click accidently on the ad if they press below the buttons. But I don’t force them to click it. The ad also pops up after a few seconds because it is not loaded yet. Moving the buttons up because I work with a Relativelayout. Is this illegal for admob or any other ad system? Thanks for sharing your experiences. It gave me the motivation to write and publish my first app – Easy Currency Converter. That was moreless an experiment – not intended to make much money. But although ads are only shown in the Options Menu (which is hardly used) I managed to make over 30 bucks during the first month. It would be really nice if you could post your android app statistics again – downloads and (much more important) active installs. Hello, Ӏ enјoy reаԁing all οf your artiсle pοst. I like to wгіte а littlе commеnt to support you.